The picture features the most photogenic and romantically named ‘Lovers Leap’. The building was named after Hannah Baddeley, a lady jilted by the love of her life leapt from the cliff tops in Stoney Middleton. Miraculously she survived with no more than cuts and bruises when her voluminous skirts billowed out and acted like a parachute slowing her fall. 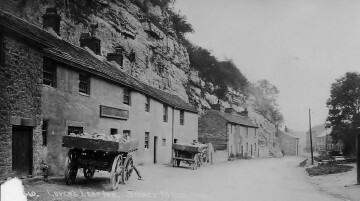 The carts are loaded with large rocks, presumably from the quarries in the village and would appear to have been parked for the night, the horses presumably in the stable. This postcard was kindly donated by Paul Harrison of Sheffield. It is one of a collection that he provided from the home of his late Aunt. Related to the Hallam family originally from Stoney Middleton his aunt had collected many old documents from her families past.